Today we review Paradise Saffr-Tone. The manufacturer got the name of this product from the word serotonin. This vegetarian capsule helps to increase happiness and positive mood. With no harsh chemicals and no toxic ingredients, this all natural supplement can help boost your daily mood. 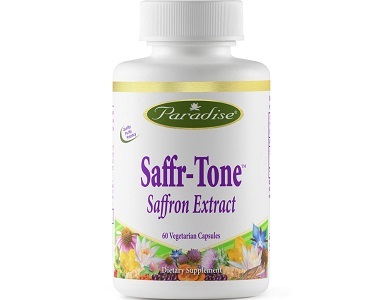 The main ingredient in this supplement is 15 milligrams of Saffr-Tone saffron stigma extract (Crocus sativus L.). While there have not been many studies on the effects of saffron, the few studies that have been done do show that saffron does have antidepressant properties similar to other prescribed medications. Unfortunately, the recommended dose has not officially been researched, and therefore, it is difficult to know if the 15 mg in this supplement will be sufficient to reach the desired outcome. How Do You Use Paradise Saffr-Tone? Unless recommended otherwise by a doctor or medical professional, the typical suggested dose for this supplement is two capsules daily, one capsule in the morning and a second in the evening. Again, without proper research on the typical dose, it is difficult to know if two capsules a day would truly give the increase in happiness that you may be looking for. One 60-count bottle of Paradise Saffr-Tone costs $19.99. Currently, the manufacturer is offering $5 off of a purchase of $40 for all new customers. Also, by purchasing 3 or more bottles at one time, you can save $1 per bottle. Free shipping can be reached with any orders over $40. 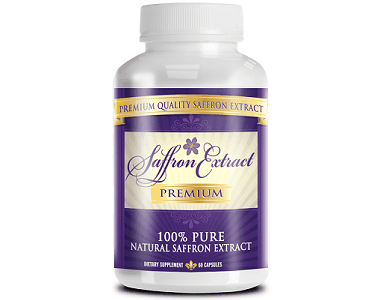 Overall, this price is higher than many of the other saffron supplements currently on the market, some of which are sold for less than half the price of this supplement. Even with the many available discounts, this product still has a high price. Unfortunately, neither the manufacturer nor the supplier mention any type of guarantee or return policy on their websites. This is concerning because if this supplement does not work in the way intended, it could be a waste of money with no chance of getting a refund. There are a few things we liked about Paradise Saffr-Tone. First off, there have been a few studies that do show the positive effects saffron has on depression. Also, the supplier did have quite a few deals on the product to bring the price lower. Unfortunately, there are many things that concerned us about this product. To start, even with the many discounts, these capsules are one of the highest saffron supplements on the market. 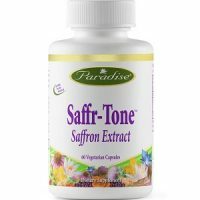 Also, it is still unknown the correct dosage of saffron extract, so it is difficult to know if the recommended dose of this supplement will truly have the positive effect it claims. Lastly, without any kind of money back guarantee, it is risky to purchase this product. If in the end, you are unsatisfied, there does not seem to be a way to return the product for a full refund. Overall, we cannot recommend Paradise Saffr-Tone to help with mood.